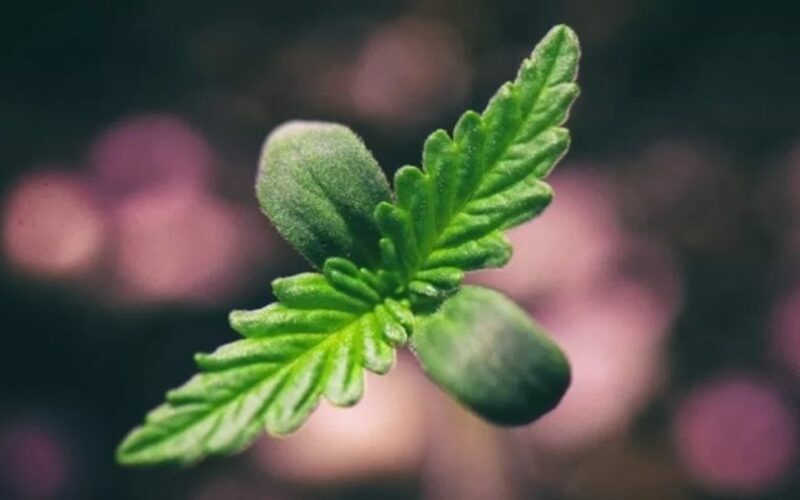 Tomorrow morning, cannabis investors will be closely watching whether Canopy Growth Corp (TSE:WEED) (NYSE:CGC) (FRA:11L1) can hang onto its 200-Day simple and exponential moving averages. Failure to defense could usher-in a fresh round of sector selling already reeling from acute outflows post-legalization. Jumping into the gory details, it was a decidedly negative day for risk assets across the spectrum. Bitcoin sliced through the psychological $5,000 barrier with ease, while “FAANG” stocks continued their plunge towards multi-month lows (Facebook Inc. minted near 22-month lows). Individual technology stocks such as Nvidia Corp. were absolutely wrecked, with the digital chip maker losing another ↓11.97% on top of the ↓18.82% it lost on Friday (bleak earnings guidance). Although cannabis has nothing to Bitcoin of tech stocks, it is another risk asset class—the type currently out of favor. The cannabis complex has been hit equally hard—if not harder—than many of its different, yet correlated peers. In fact, no Canadian LP has been spared severe punishment over the past month; only the degree of hardship varies. With the cannabis sector now hanging on a knife’s edge, all eyes turn to Canopy Growth tomorrow to provide sector directional guidance. Specifically, Canopy Growth is straddling the all-important 200-Day SMA/EMA—a universally acknowledged indicator gauging the macro health of a security or index. Several Tier-1 cannabis stocks such as Aphria and Aurora Cannabis are below this key threshold, while others like Hexo Corp. and Organigram Holdings are marginally above it. However, if the industry’s benchmark LP can’t maintain this level, the sector cannot, by definition, appropriate much upside momentum. Heading to the charts, we can glean how precarious Canopy Growth’s proximity to the 200-Day MA really is. 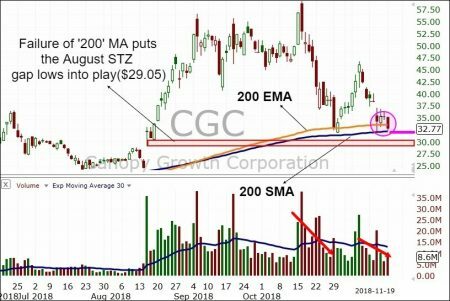 CGC is straddling the midpoint between the simple and exponential ‘200’, with any downside gap threatening this dynamic. Should this give way, the next important backstop on the daily is at $29.05/share—the gap lows following Constellation Brands massive C$5 billion equity deal with the company. Some minor support may reside around the $30.20/share level. Thus, we will be watching intently to see whether Canopy Growth makes a stand on-open tomorrow, or succumbs to the persistent selling dogging risk assets of all sorts. The stock’s early reaction should set the course for sector trade in the near term. Canopy Growth finished the after hours session at $32.33/share, down $0.44 (↓1.34%).